A giant prawn takes over the plate. They were the biggest prawns I’d ever seen. Giants, which one could only assume had been caught by a sea-faring laird wielding a trident. I encountered these beasts during a recent meal at the newly refurbished Bombay Palace near Marble Arch. The restaurant – which has been open since 1981 – has had a full interior makeover complete with dark purple accents and contrasting crisp white features to turn it into a more modern space for dining. There are eight locations of Bombay Palace globally – from Beverly Hills to New York and Toronto (though, I never came across it in my former hometown). The jumbo (read: humongous) prawns are called Tandoori Jhinga on the menu. And while my fellow diners and I implored the head of house to give up his secrets as to where these creatures had been spawned, we were turned down in our requests. My belief: he has a nuclear breeding tank in the basement! But regardless of their origins, a few of those bad boys would constitute a main meal for most people. Spungy and spicy, the prawns oozed juices and tangy flavours – definitely a must try if you visit. But this was only the beginning. 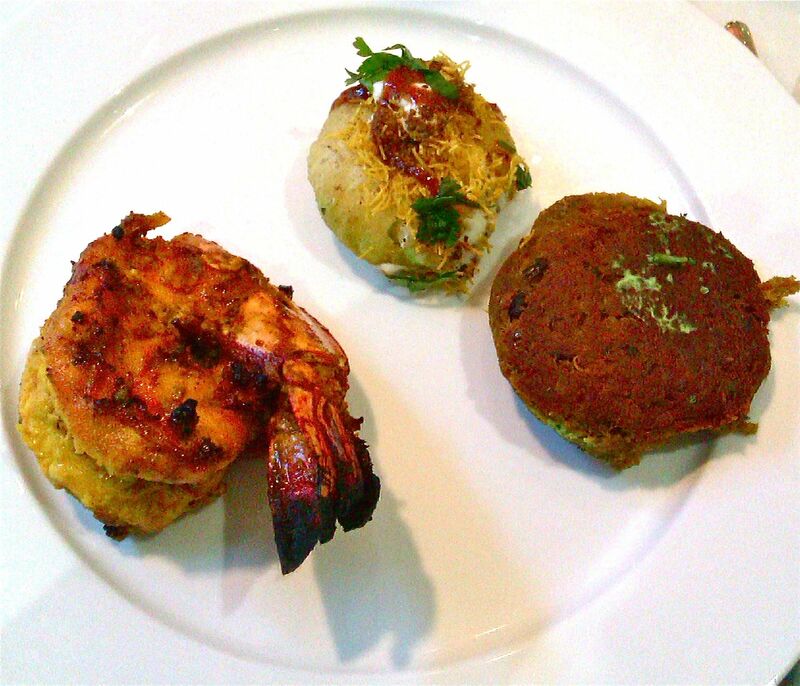 Also on the menu to start were Shikampuri kebabs (ie: lamb kebabs), chicken tikka skewers and Dahi Batata Poori. The latter was by far my favourite – the crisped lentil puff (like an air popped crisp) was filled with bean sprouts and coriander, and topped with yoghurt, mint and tamarind. Every bite was seduction – from the first crisp crunch, to the cool gooey yoghurt and finally the sizzle on the tongue of tamarind and coriander. Beautifully coloured curries tempt me for my main. For mains, I tried a selection of interesting foods – from the more standard tarka dal and changezi champen (grilled lamb cutlets), to the less common Goan fish curry and Jaipuri bhindi (shredded, deep fried okra). The Goan fish curry was the standout for me – a perfect combination of sweet and spicy, garnered from a balance of chillies, mangoes and coconut, with tender dollops of fish dotted throughout the thick sauce. 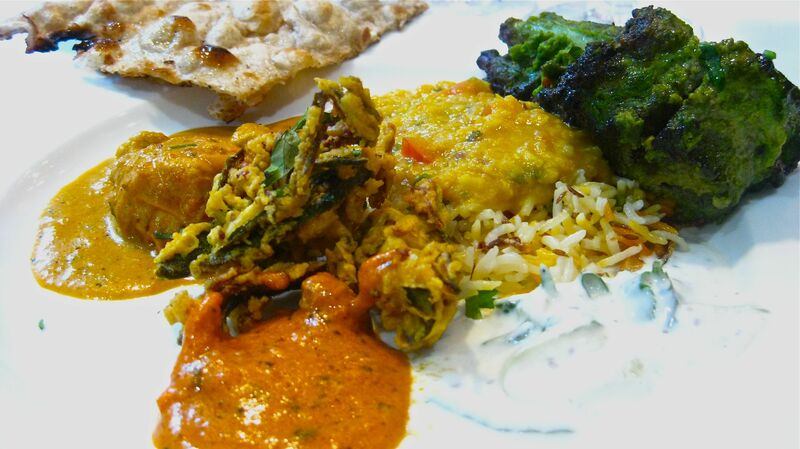 And while I prefer my tarka dal with a bit more of a buttery flavour, the other dishes pleased as well. 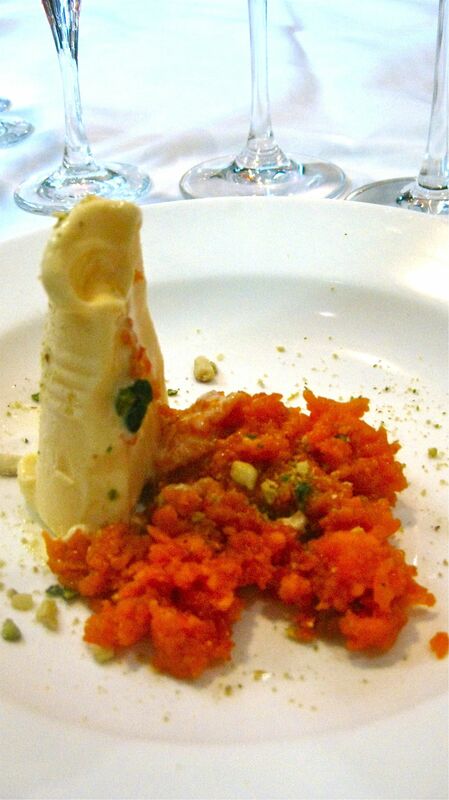 Despite being stuffed, I plowed through and gave the gajar halwa (grated carrot fudge) and kulfi a try as well. The former was a bit like gulab jamun – a sweet, doughy dessert commonly found floating in a sugar syrup. But this had the texture of fudge. The cool kulfi made from pistachios and saffron helped balance out what could have been too overpoweringly sugary, making it a nice note to end the meal on.